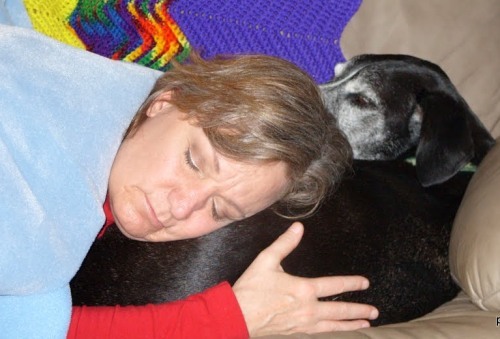 Just after midnight I said goodbye to my best little buddy, my guardian, my sidekick for the past nearly 11 years. On February 10, 2000, I felt an inexplicable and unrelenting need to go to the local animal shelter, somehow knowing there was a dog there waiting for me. After nearly three hours of visiting what I thought was all the dogs, I still hadn't found THE one, so made one more pass through the kennels. That is when I saw him. Huddled at the back of Kennel D30 where he had lived for the previous month and a half, an adorable 5-month-old Pointer mix had given up hope of finding his forever home. I went in to visit him and one look into those eyes and I knew he was the one who had beckoned me. It was closing time, so Steve and I told the ladies up front that we wanted to adopt the dog in D30, but knowing they were closing, we would come back in the morning to pick him up. But they told us they would stay late to process the paperwork, since that puppy would not be there the next day, as his time was up and he was scheduled for euthanasia. We filled out the paperwork, naming our new dog Spyder, and brought our sweet boy home, where we've shared almost 11 wonderful years with him. Spyder has been my best friend and protector, always by my side, with a boundless joy and enthusiasm for life unmatched by anyone. 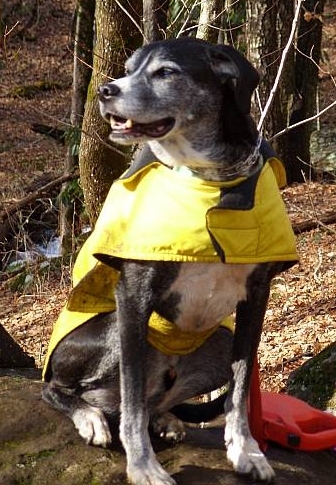 He's traveled to mountain bike races in multiple states with me, where he earned respect from mountain bikers everywhere as an "Awesome Trail Dog" who could easily keep up with the best. He's gone hiking with me on trails all across the state, played at the beach, delighted the neighborhood kids at Halloween wearing his leopard costume, and made me laugh even when depression threatened to drain the life out of me. In fact, I don't think I rescued him at all - I believe HE rescued ME all those years ago. Five weeks ago tonight, he was given the presumptive diagnosis of osteosarcoma - bone cancer - in his left shoulder. 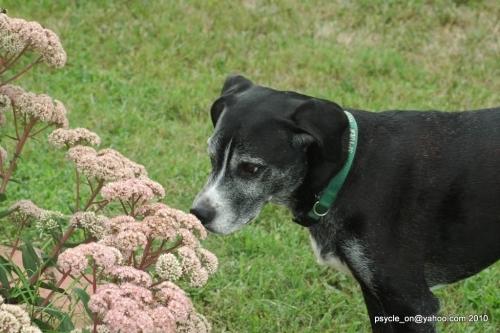 Despite that, he had been doing reasonably well on his medications, remaining his usual happy and active self, and was even getting along pretty normally tonight up until about 11:40 p.m., when he suddenly became weak and unable to stand, with staggering, panting and labored breathing. After an urgent call to the veterinary emergency hospital, Steve gathered Spyder up in his arms and we rushed him to the doctor. By the time we arrived just after midnight, Spyder had already become limp, cool and pale, with shallow respirations and almost imperceptible heartbeat. Dr. Sherrod told us he was at the end of his life, and he in fact passed away before a decision could even be made about euthanasia. 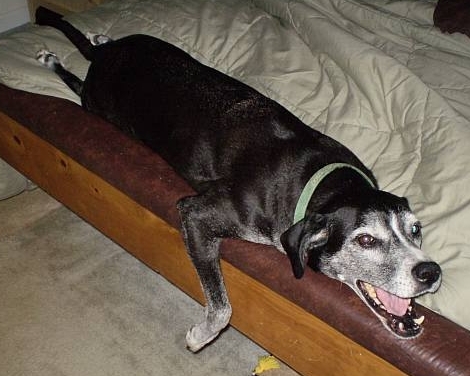 Spyder died the same way he lived - on his own terms - and was active and happy up until the very end. The probable diagnosis was a stroke or heart attack caused by a blood clot from the cancer tumor. 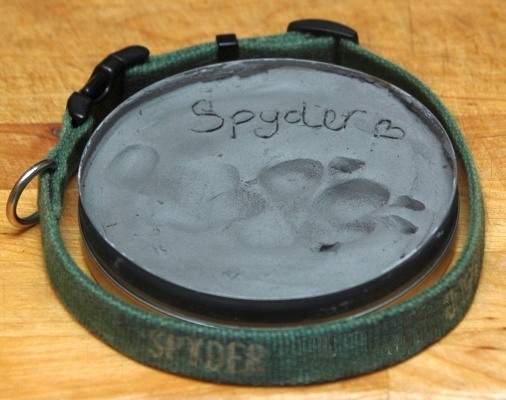 He will be cremated, and we were given a clay imprint of his paw as a memorial. My heart is breaking at the loss of my sweet boy, even though I know he had a wonderful life most dogs only dream of, and there will never be another like him. He was one of a kind, my special little man, and he made my life complete. I miss you, Spyder, and will always love you. Rest in Peace little one. Until we meet again at the Rainbow Bridge. Your Pawprints are Forever on my Heart.